Where are the composers of yesteryear, when the likes of Erich Korngold (The Sea Hawk) and Max Steiner (Gone With the Wind) created theme music and background music that sang at the perfect pitch of their movies' emotions? Nowadays, composers either provide studious evocations of the great old stuff (Desplat for The King's Speech) or manufacture an industrial-strength soundscape (Reznor and Ross for The Social Network). The Nine Inch Nails guys' work on the Facebook film was no mean achievement, but would anyone want to listen to the whole sound-track CD straight through? O.K., enough alter kocker whining. Desplat's and Zimmer's scores certainly contribute to their films' success — the first subtly, the second with suitable bombast. And there's no doubting the Academy members' exhaustion as they approach the end of filling out their ballots, remember how they cried as the King learned to speak and figure the music must have been an accelerator to their emotions. But we're trusting — the word might be hoping — that they'll recognize 127 Hours, the one film that is organically dependent on its music and that at its climax soars on its score the way classic movies so often did. Rahman, the world's most prolific and popular composer, lent his irrepressible melodic gift to Danny Boyle's Slumdog Millionaire, set in Rahman's native land, and nearly tops himself here with music that is tense, oppressive and finally exalting. 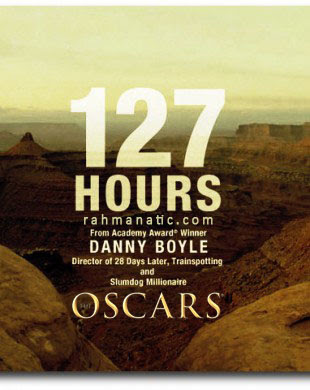 While The King's Speech is still the favorite, we're leading with our heart and betting on 127 Hours.